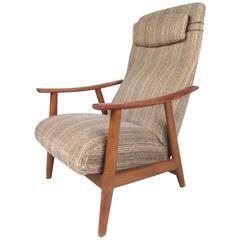 Danish modern, lounge chair features a maple frame with high, slat back, scoop arms and overall unique detailing. The cushions are newly upholstered in rust corduroy. 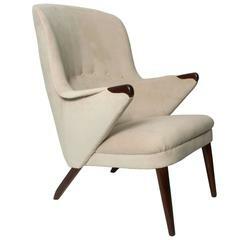 High Back Lounge Chair in Caramel Vinyl. 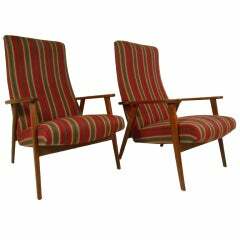 This lounge chair is in all-original condition and is very comfortable. 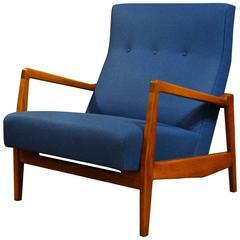 This lacquered beech high back lounge is in original leather upholstery. 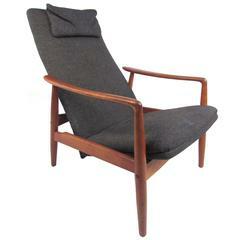 High Back Danish lounge chair. Original leather is worn.